"The end justifies the means, right?" 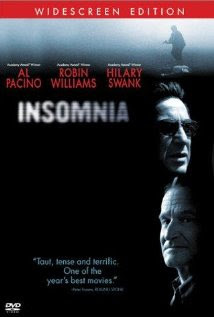 Insomnia feels like a movie you have seen before. Yet there is something compelling about this murder mystery set in the never ending Alaskan summer days, layered with naivety, dishonesty, and malice. Under investigation by Internal Affairs, embattled cop Will Dormer (Al Pacino) and his partner Hap Eckhart (Martin Donovan) have been sent to a small town in Alaska, to investigate the horrible death of a teenage girl. Situated by the Arctic Circle Nightmute Alaska is a place where the sun never sets during summer. In pursuit of the killer, Dormer accidentally shoots his partner, but due to a series of circumstances goes with the story that it was killer who shot Eckhart. Dormer is then contacted by Walter Finch (Robin Williams), who not only confesses to the murder of the girl, but blackmails Dormer about knowing that he shot his partner. As Dormer struggles with lack of sleep, he finds himself being pulled deeper into a series of lies, deception and working with the killer to frame an innocent boy for the girl's murder. His only saving grace may be the young officer Ellie Burr (Hilary Swank), who is investigating the death of Eckhart and may hold the moral compass Dormer so desperately needs. The story is interesting, but fairly commonplace. What makes the difference is the casting of Al Pacino and Robin Williams. With his stone faced expression, Pacino has the unusual knack of demonstrating a wide range of emotions - guilt, frustration, anger and compassion - all the while looking like he just woke up. Robin Williams is brilliant. There is an underlying steel to the local crime thriller writer that makes him way more creepier than one-hour photo ever did with the glasses and ginger hair. Swank is perfect as the starry eyed detective, that struggles with the idea that her idol may have been the guy that killed his own partner. Christopher Nolan's screenplay is in no hurry. The camera switches between modes of intense character scrutiny, and wide, lazy panoramic shots that make you nostalgic about a place you have never been to. If Fargo was the initial purveyor of the snow covered desolate countryside, Insomnia took it up a notch by adding in the eternal sun. Through out the movie there is a distinct cloud cover, that adds a melancholy undertone, capturing the mood of the narrative. Netflix had this in my suggested movies list for the longest time, and for some reason I never added this to the queue. I have been a tad skeptical of star-powered movies. But now that I have seen it, I am glad I did. Now I can sleep in peace.